Marriage*: She married Thomas Willitts. Marriage*: She married Richard T. Cann. Other Names*: Jeanett Reed Cann, Jeanett Cann, Jeanette Reed, Jeanette Reed Cann, Jeanette Cann. [S1441] Wilmington Morning News, Wilmington, Del., online at http://www.newspapers.com, 7 Feb 1934, p. 2, col. 2 (obituary for Mrs. Lillie J. Naudain) (naming Jeanett Cann as her mother). Marriage*: He married Ida May Auten. [S1097] Descendants of Johann Melchior Hafa, online, above, (naming William Francis Hoffa as his father). Marriage*: She married William Francis Hoffa. [S1098] Descendants of Timen Stiddem, online, above, (naming Aaron Klair as his father). Marriage*: He married Mary ('Polly') Early. [S1100] Ginga Mylius, electronic mail to Roger Bartlett, 19 Aug 2006, (naming Maj. George Watkins as her father). Marriage*: She married Maj. George Watkins. [S1100] Ginga Mylius, electronic mail to Roger Bartlett, 19 Aug 2006, (naming Mary ['Polly'] Watkins as her mother). [S1100] Ginga Mylius, electronic mail to Roger Bartlett, 19 Aug 2006, citing letter dated 1 Dec 1882 from Mrs. Helen Bush of Augusta, Georgia to Dr. Thos. A. Watkins, Austin, Texas (naming Helen Zubly Clarke as her mother). [S1100] Ginga Mylius, electronic mail to Roger Bartlett, 19 Aug 2006, citing letter dated 1 Dec 1882 from Mrs. Helen Bush of Augusta, Georgia to Dr. Thos. A. Watkins, Austin, Texas (naming Daniel S. Bush as her father). [S1100] Ginga Mylius, electronic mail to Roger Bartlett, 19 Aug 2006, citing letter dated 1 Dec 1882 from Mrs. Helen Bush of Augusta, Georgia to Dr. Thos. A. Watkins, Austin, Texas. [S1102] The Burdine Family, "J. D. Burdine Family," in Navarro County History, vol. 2 (Corsicana, Tex. : The Navarro County Hist. Soc'y, 1978), p. 206. [S1102] The Burdine Family, "J. D. Burdine Family," above, (naming James Hill Jones as his father). [S1102] The Burdine Family, "J. D. Burdine Family," above, (naming Susan Elizabeth Johnson as his mother). [S1102] The Burdine Family, "J. D. Burdine Family," in Navarro County History, vol. 2 (Corsicana, Tex. : The Navarro County Hist. Soc'y, 1978), p. 206, (naming James Hill Jones as his father). [S1102] The Burdine Family, "J. D. Burdine Family," above. [S978] John Paul Smith, Records of Lawrence County, Mississippi, Volume I (Jackson, Miss. : n.pub. 1984), p. 301 (Petition for Letters of Administration) (naming Daniel Williams as his father). [S978] John Paul Smith, Records of Lawrence County, Mississippi, Volume I (Jackson, Miss. : n.pub. 1984), p. 301 (Petition for Letters of Administration) (naming Daniel Williams as her father). [S978] John Paul Smith, Records of Lawrence County, Mississippi, Volume I, above, p. 301 (Petition for Letters of Administration). [S978] John Paul Smith, Records of Lawrence County, Mississippi, Volume I (Jackson, Miss. : n.pub. 1984), p. 301 (Petition for Letters of Administration). [S327] Mrs. Ed Ellington, "S. E. Ellington Family," in Navarro County History, vol. 2 (Corsicana, Tex. : The Navarro County Hist. Soc'y, 1978), p. 206. [S1108] Social Security Death Index, online at http://tinyurl.com/RootswebSSDI, viewed on 3 Feb 2007 (stating that he died in Jun 1978; not naming the place of death but stating that he lived in Corsicana, Tex. when he died). [S327] Mrs. Ed Ellington, "S. E. Ellington Family," above (naming Sidney Errol Ellington as his father). [S585] Corsicana Daily Sun, Corsicana, Tex., online at http://www.corsicanadailysun.com 19 Aug 2013 (obituary of Dillard Earl Ellington), viewed on 20 Aug 2013 (naming Sidney Erroll Ellington as his father). [S1108] Social Security Death Index, online at http://tinyurl.com/RootswebSSDI, viewed on 3 Feb 2007 (not naming the place of death but stating that she lived in Corsicana, Tex. when she died). [S327] Mrs. Ed Ellington, "S. E. Ellington Family," above (naming Hattie Corene Ramsey as his mother). [S585] Corsicana Daily Sun, Corsicana, Tex., online at http://www.corsicanadailysun.com 19 Aug 2013 (obituary of Dillard Earl Ellington), viewed on 20 Aug 2013 (naming Hattie Ramsey as his mother). 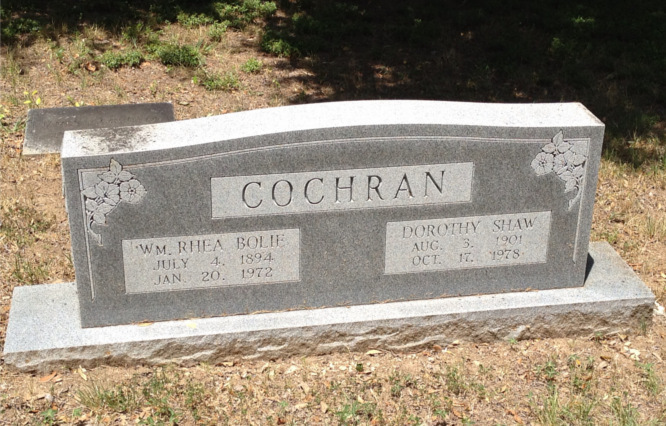 Dorothy Shaw Cochran's grave marker, Cochran Chapel Cemetery, Dallas, Tex., photographed by Roger Bartlett. [S1108] Social Security Death Index, online at http://tinyurl.com/RootswebSSDI, viewed on 4 Feb 2007 (stating that she died in Oct 1978; not naming the place of death but stating that she lived in Dallas, Tex. when she died). [S1107] Cemetery marker, Cochran Chapel Cemetery, Dallas, Texas (common marker with Wm. Rhea Bolie Cochran). [S976] The Dallas Morning News, Dallas, Tex., online at http://www.dallasnews.com, 14 Jun 2005 (obituary for Alice Charlene Cochran Styron), viewed on 26 Feb 2014 (naming Dorothy Shaw as her mother). [S67] The Dallas Morning News, Dallas, Tex., 14 May 1960, sec. 3, p. 8 (obituary of James William Harrison) (naming James William Harrison as his father). [S1108] Social Security Death Index, online at http://tinyurl.com/RootswebSSDI, viewed on 3 Feb 2007 (stating that he died on 17 Jan 1998; not naming the place of death but stating that he lived in Dallas, Tex. when he died). [S1107] Cemetery marker, Cochran Chapel Cemetery, Dallas, Texas (common marker with Bernelle Yates Harrison). Marriage*: She married Saint Elmo Harrison, son of Robert Carter Harrison and Letitia Jane Bachman. [S67] The Dallas Morning News, Dallas, Tex., 27 Oct 1937, part 1, p. 12 (naming Alex Meletio, Sr. as the father of his brother). Marriage*: She married Alex Meletio Sr.
[S67] The Dallas Morning News, Dallas, Tex., 13 May 1986, p. 11B (obituary of Alex Meletio, Jr.) (not giving the date but stating that he was seventy-three years old when he died on 11 May 1986 and that he was a native of Chicago, Illinois). [S67] The Dallas Morning News, Dallas, Tex., 13 May 1986, p. 11B (obituary of Alex Meletio, Jr.). [S1108] Social Security Death Index, online at http://tinyurl.com/RootswebSSDI, viewed on 3 Feb 2007 (stating that he died in May 1986; not naming the place of death but stating that he lived in Dallas, Tex. when he died).